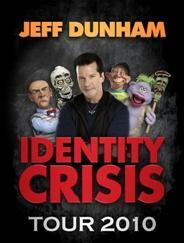 Jeff Dunham on his ALL NEW 2011 "Identity Crisis Tour" is coming to Tampa! Listen up Tampa Bay, this is an exciting update. Lisa here, with Tampa Bay Entertainment News! This is sure to make you laugh your pants off (well maybe not completely off, but you get the picture). Jeff Dunham is coming here to the St. Pete Times Forum for his stand up show, and I have all of the details. The show isn&apos;t until February 24th but the St. Pete Times Forum Tickets are going on sale Friday, November 5th. Jeff Dunham is a comedian, who has cornered the market for Ventriloquist acts. He continues to prove himself year after year, award after award. Recently he was presented with a triple platinum award for his DVD sales of over 75,000 by Sony Music in South Africa. This means that Jeff has become the "top-selling international comedian on DVD in retail in South Africa." (That is pretty awesome!) In the United States his four DVD titles have sold six million copies! He had been the best-selling live comedian in North America for two years in a row, and has been playing in venues seating 7,000 to 10,000 people. In addition to his many awards, he has also found time to write an autobiography titled, All By Myselves: Walter, Peanut, Achmed, and Me. This book details Dunham&apos;s rise to the top of the comedy circuit and is written in his own words with the help of his sidekicks. His sidekicks are Walter the grumpy retiree, Bubba J the NASCAR loving redneck, Peanut the furry and manic one, Jose Jalapeno a spicy pepper from south of the boarder, and Achmed the dead terrorist. These characters are all performed by Jeff (hence the Ventriloquist part), and are the reason he has become so successful. He is a unique entertainer and a great addition to Tampa Bay Nightlife. Tickets go on sale at noon on November 5th and they are available at the Straz Center Box office, or ticketmaster. So get out there Tampa, and enjoy this unique Tampa Bay Entertainment!